The Clonkill players and mentors line up for a minute's silence in memory of Annabel Loughlin. ©INPHO/Laszlo Geczo. Despite the funeral of little Annabel Loughlin, daughter of former Westmeath hurler and Clonkill stalwart Enda, having taken place only a few hours earlier, the Leinster SHC club quarter-final between Clonkill and Ballyboden St Enda's went ahead last night with the blessing of Annabel's family. 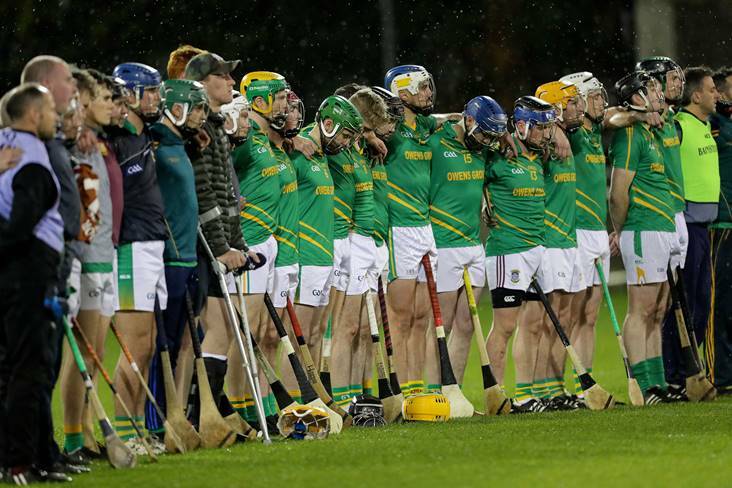 It proved to be an emotionally-charged occasion with the Clonkill men giving a wonderful account of themselves in the most trying of circumstances before eventually losing to their much-fancied Dublin counterparts after extra-time. A very sporting Ballyboden St Enda's played their part too by providing a guard of honour to the grief-stricken visitors after an epic battle while, in a lovely touch, the words 'Rest In Peace Little Annabel' appeared on the electronic scoreboard at one stage. A minute's silence was also impeccably observed before the throw-in. Very proud to manage a great group of men in the @Clonkillhurling senior team. Sorry we didn't get the job done. Thanks to everyone for their support. I hope we did Enda and his family proud. Best of luck to @Bodengaa. Rest in peace Annabel.